Review: "Judas Priest: Jugulator" - Sea of Tranquility - The Web Destination for Progressive Music! Once upon a time, an underacknowledged thrash metal outfit known as Slayer covered "Dissident Aggressor", first performed by one of the progenitors of heavy metal, Judas Priest. Now the tables have turned, and as Slayer is seduced by the farcical industrial and punk crazes, Priest has stepped forward to take their place with their heaviest album to date. Even Painkiller will not prepare the Priest veteran for this album. I emphasize the relationship to Slayer because Jugulator resembles their work more than it does previous Judas Priest. Elements of Anthrax and Pantera are also noticeable. Judas Priest has definitely been influenced by this decade's releases, and thankfully not by the alternative and grunge aberrations that have claimed so many (a glance at the cover art will convince you of that). The ferocious, sludgy riffs and guttural background vocals point to the death metal scene. Although I would love to relive the heyday of heavy metal with another Ram It Down, I'm content, but not elated, with their evolution. 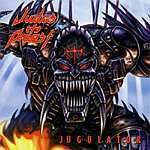 Jugulator begins rather lamely with the title track. Although fast and heavy, it seems like a showcase piece for new frontman Tim "Ripper" Owens, who interjects an unnecessary number of gratuitous Rob Halford screams. Although he reproduces these very well, his "normal" singing voice doesn't compete with Halford's expressiveness. Most of the other tracks are like meals at a nice restaurant: they're pretty good at the time, but you won't remember them the next day (yes, I decided against the other obvious metaphor). Most of them contain some nice beats and lead breaks in places, but they never seem to be able to build the song around them. Fortunately the album ends with two more memorable songs. "Bullet Train" is the most "Priestly" sounding track, with the classic dual guitar work of K.K. Downing and Glenn Tipton clearly recognizable. "Cathedral Spires", nine minutes long and my personal favorite, is successful in incorporating some elements of doom metal in its chorus. As is the case with many of the arena rock icons of the 80's, Judas Priest has fallen into a trap with this latest release. The dedicated fans who rush out to buy the CD the moment it is released will probably be disappointed, while those who would most enjoy it will most likely offer a smug grin and shun it as an embarrassing relic of corporate rock. Speaking with the least bias possible, it's not an outstanding album, but it's a good one. Perhaps the best part about the release will be the tour, where we'll all get to wax nostalgic watching "Hell Bent For Leather" performed live for what may be the last time.